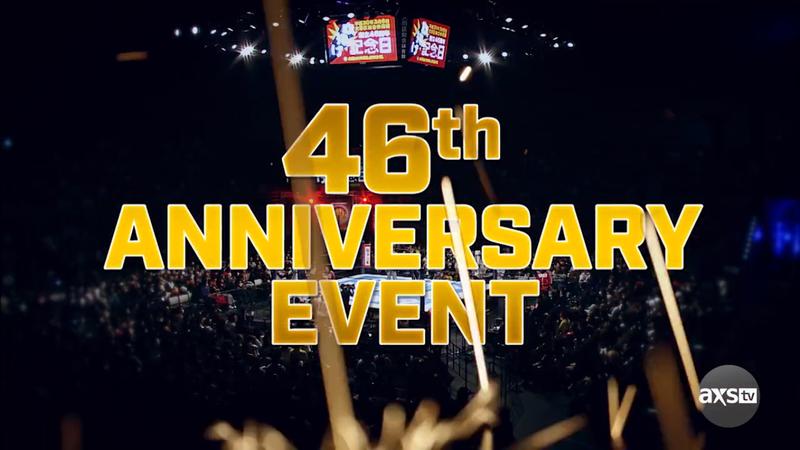 Mitchell’s NJPW AXS TV Report: 46th Anniversary Show part 2! This review of NJPW: 46th Anniversary Show will be as broadcast by AXS TV. Tetsuya Naito VS Taichi w/ Miho Abe; Naito wins. Kazuchika Okada VS Will Ospreay; Okada wins. 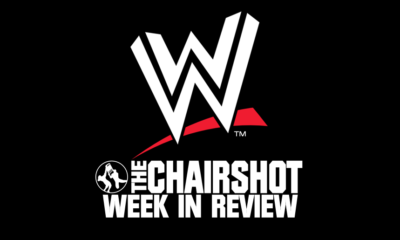 AXS TV and NJPW review what led to tonight’s matches. 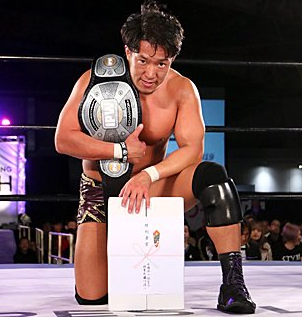 The IWGP Heavyweight Champion, Kazuchika Okada, has successfully defended his title ten times, and closes in on the record set by Hiroshi Tanahashi. However, knowing his ally, Will Ospreay, wants to show the power of Junior Heavyweights, he has accepted this Champion VS Champion challenge! Will the leader of Chaos humble the Aerial Assassin? Meanwhile, Suzuki-Gun’s Taichi takes aim at the leader of Los Ingobernables de Japon, Tetsuya Naito. The World’s Sliest Wrestler wants after the Uncontrollable Charisma over the goading to enter the Heavyweight Division. Naito might eat his words now that Taichi is coming for him, but will he still be Tranquilo through it all? Tetsuya Naito VS Taichi w/ Miho Abe! Accompanied by his manager, Suzuki-Gun’s sly performer prepares to make El Ingobernable pay for provoking him. Will Taichi be singing his own praises after tonight? Or will he fall flat during his performance? But Taichi doesn’t wait for the bell, he blindsides Naito with his microphone stand! 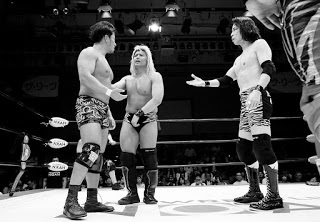 However, the referee didn’t see a thing because he was busy with Miho and other Suzuki-Gun members on the apron. Taichi tosses his mic away to then pursue Naito on the outside. He brings Naito up the walkway, and he rakes the eyes before throwing Naito into guard rails. The bell finally rings, and Taichi brings Naito back to the red corner ramp, going for a powerbomb. Naito blocks so Taichi gives him knees to the head, and then completes the powerbomb! Taichi leaves Naito for dead on the ramp, and the referee checks on Naito while Taichi returns to the ring. Naito stirs as the 20 count begins. Taichi mocks the Tranquilo while Naito crawls. The count gets halfway before Naito starts getting up on his feet and hurrying to the ring. It gets past 15, Naito manages to beat it at 19! Taichi grins as he rolls over to Naito to further mock his mannerisms. Taichi stands and laughs, then takes his time bringing Naito over for a cocky cover. TWO, but Taichi still laughs. He toys with Naito, then pulls off his hoodie to hit him with it. Taichi taunts Naito, Naito throws a chop, but it doesn’t do a thing. Naito keeps trying, but Taichi is still unaffected. Taichi hits Naito with a spinning back kick, then grins as Naito staggers. Taichi again rakes the eyes, then takes his time to brush off his shoulders. He takes aim at Naito from across the way as Naito crawls to a corner. Taichi runs in, but into Naito’s boots! Naito boots Taichi away again, then runs out, and gets Taichi into the dragon sleeper and neckbreaker. Naito keeps moving and dropkicks Taichi in the back of the head. Taichi rolls out of the ring while Naito still recovers from the powerbomb. Fans cheer for Naito, but Miho comes over to check on Taichi. Naito rolls out of the ring and fetches Taichi, to then whip him hard into rails. Naito keeps going, throwing Taichi into more rails. Taichi writhes but Naito keeps going, and gets a third whip into the rails! The camera crew moves aside as Naito brings Taichi up in to the ring. Naito stomps Taichi, then drags him up to put him in a corner. He stomps away more, then spits on Taichi before stomping him again. Naito drags Taichi up and whips him corner to corner, then runs in. He catches Taichi’s boots, and spins him sideways, for a draping dragon sleeper neckbreaker! Naito rolls Taichi over for his own cocky cover, TWO. 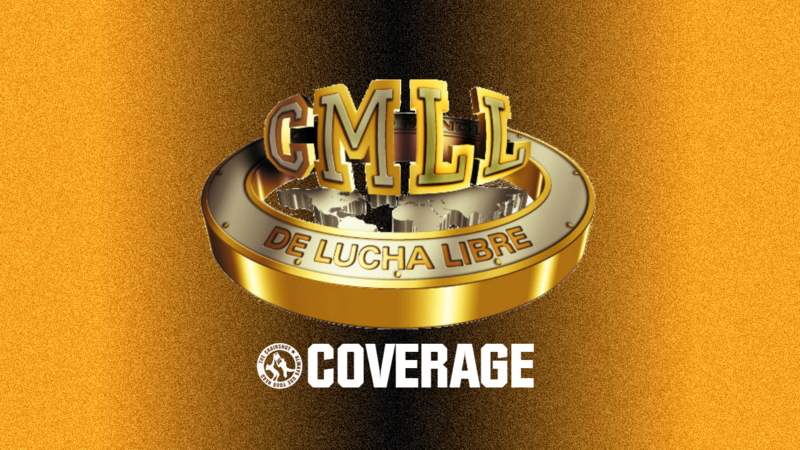 El Ingobernable is back in the fight while we go to break. NJPW on AXS returns to see Naito still stomp Taichi. Naito brings Taichi up and gives him a hard back elbow. Taichi ends up in a corner, Naito runs in from the side for the jump kick. Naito lands on the apron, but Taichi immediately swing kicks him down! Naito hits the apron edge then tumbles to the floor. The referee checks on Naito and sees he’s okay to continue. Taichi takes a moment before going out to fetch Naito. He brings Naito up and whips him into railings in return for earlier. He puts Naito back in the ring, then gives him a killer buzzsaw kick. Taichi uses another cocky cover, TWO! Taichi rips off his pants! Now he’s serious. Naito stirs, and Taichi prepares another kick. Naito blocks it, atomic drop, and then runs the ropes for a tornado DDT! Fans rally for Naito as he slowly stands up. Naito goes over to Taichi in a corner, and hoists him to the top rope. He climbs up to join Taichi, and hits the SUPER Steiner! Cover, TWO! Naito calls for the end, and drags Taichi back up. He wrenches the arm but Taichi counters with a big back suplex! Taichi gets up and waits for Naito. Naito stands on wobbly legs, Taichi clubs him from behind with a clothesline. Naito staggers and rebounds off the ropes, Taichi runs him over with an ax bomber! Cover, TWO, but Taichi keeps going, bringing Naito up for the Taichi-shiki Last Ride! High stack cover, TWO! Fans are thunderous for Naito, but Taichi is up first. He drags Naito up, and goes to shovel him up onto his shoulders, but Naito hops off the back end to hit Taichi with the Reverse-Rana! Both men are down, and the referee checks on them. They’re both okay to continue, so Miho and Taka Michinoku work to coach Taichi back into things. Naito stirs first, followed by Taichi, and Taichi dropkicks Naito’s legs out. Taichi goes for his Taichi Clutch but Naito slips out the back end. Naito goes for the German Suplex but Taichi blocks and counters with an enziguri! Taichi brings Naito up but Naito suddenly springs the German Suplex on him! Naito brings Taichi back up, for Gloria, the hammerlock sit-out slam! Cover, TWO! But Naito just fires up, and brings Taichi up a third time. 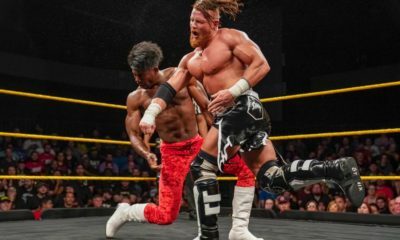 He arm wrenches, tilt-o-whirls, but Taichi throws him off. Taichi blocks Naito’s kick, and shoves the referee aside so he won’t see the low blow kick! Taichi Clutch cover, TWO!! He can’t believe it, and even Gedo, who created the move under his name, seems a bit surprised. Fans rally for both men as they slowly stand. Taichi prepares his kick again, but Naito evades to hit a rolling kick! Both men go down again, but Taichi gets to his blue corner, and his mic stand. Naito slowly stands up, and Taka covers for Taichi again, but Naito sees the mic stand attack coming! He dodges it, to then enziguri Taichi! Naito takes the mic stand, but now the referee sees. The referee won’t let Naito use the item, so Naito shoves the referee into Taka! Taka goes down hard, and Naito prepares to use the mic stand, but Taichi catches him with another enziguri! Taichi runs in, but Naito pops him up for a low blow in return! Naito picks up the mic stand again, and takes aim, to WHAP Taichi in the head with it! The microphone breaks off the stand, and then Naito breaks the stand. The referee comes to while Naito brings Taichi up, for Destino! Though he is victorious, Naito is not respectful, as he spits on the downed Taichi. Now that he’s in the Heavyweight Division, will the World’s Sliest Wrestler be able to keep up with the world’s most Tranquilo wrestler? Kazuchika Okada VS Will Ospreay! It’s Chaos VS Chaos and Champion VS Champion as the IWGP Heavyweight and IWGP Junior Heavyweight Champions fight to see who is both the best within their faction, and best within all of NJPW! Will the Aerial Assassin come through on his word and do what others haven’t? Or will the Rainmaker continue to overcome all who step to him in the ring? To Ospreay’s surprise, fans sing, “Ospreay~, Ospreay Ospreay Ospreay~! Ospreay~! Ospreay~!” Okada is actually rather amused by it. That aside, both men finish preparations and shake hands, and the match begins. Okada and Ospreay rush forward but then stop, already having a stand-off. They stare down, then circle and tie up. Okada gets the waistlock but Ospreay the standing switch. Ospreay gets the waistlock takedown and floats over to the facelock. Okada rolls but Ospreay keeps the hold, so Okada rolls again to slip out and get the hammerlock. Okada snaps back to tweak Ospreay’s arm, then they both stand up. Ospreay works his way out of the hold and reverses it onto Okada. Okada works to do the same, with a roll and handspring to the wristlock. Ospreay brings Okada to a knee to reverse the wristlock back, and fans applaud. Okada rolls, gets the ankle pick, then goes after Ospreay’s leg. Ospreay pushes back with a forearm, but Okada still wrenches the knee and ankle. Ospreay uses his free leg to pry Okada off and goes for the cross armbreaker, but Okada sits up to slip into a waistlock. Okada shifts to a leg, and puts Ospreay’s legs in the figure four knot. He grabs Ospreay’s arms, and flips over into Cattle Mutilation! Ospreay endures and rolls, but Okada holds on to his arms. They stand up, Ospreay reverses the arm wrench, then hammerlock to headlock. Okada powers out, shoving Ospreay to a corner, but Ospreay comes back. Ospreay goes for an ankle pick takedown but Okada sits on it to cover, ONE into Ospreay’s sunset cover, ONE into Okada’s jackknife attempt but Ospreay turns that back into a sunset! TWO, Okada cradles Ospreay, TWO into Ospreay’s crucifix, TWO! Both men stand up and keep going while fans applaud, Okada wants another jackknife cover. TWO into a bridge out and spin around for the backslide, TWO! Fans really fire up now as Okada slips out of the ring. Ospreay grins at how close he was, and fans are chanting for him now. Okada catches his breath before returning, and fans build to a rally. They circle in the ring again, tie up, and push each other with shoulders. Okada uses that to roll Ospreay into the double finger grip. Ospreay tries to use power but Okada brings him back in. Ospreay tries one more time, and gets around, but Okada just uses that to spin all the way through to return to the grip. Okada wrenches the hands harder, but Ospreay wants it one more time. They turn, Ospreay flips Okada but Okada lands on his feet and pushes Ospreay down. Ospreay bridges to deny a cover, so Okada sweeps the leg. ONE, but Ospreay goes back to bridging. Okada tries again, ONE but Ospreay is right back up. Okada uses his weight to bring Ospreay down, but TWO and Ospreay gets the bridge back. Ospreay sees Okada wanting to try again, and uses that to monkey flip Okada up and over. Both men are down and covering each other, TWO as they both get shoulders up. They relax but that returns to the double cover, TWO as they go the other direction. They relax to a third double cover, TWO as they both bridge! Fans applaud this great exchange. The two roll to their feet. Okada shovels Ospreay over with a double wrist body drop, but Ospreay lands on his feet. Ospreay runs but ducks Okada’s attack to swing a kick, Okada ducks that and goes for the wristlock swing out! Ospreay ducks again, then springboards back, but Okada gets clear. It’s another stand off, and the fans applaud again while we go to break. NJPW on AXS returns, and the fans cheer as the two champions circle again. They tie up, Okada pushes Ospreay to ropes, and the break is clean, but Ospreay dares Okada to hit him. Okada reels back and Ospreay braces for it, but Okada just pats Ospreay’s shoulders, so Ospreay immediately slaps Okada! Ospreay kicks but Okada blocks, so Ospreay hits a forearm then stomps Okada’s foot. Ospreay shoves Okada down, then runs. Okada gets up, things speed up and Ospreay front flips over Okada. Ospreay turns around but Okada side-steps, Ospreay hits a headscissors on the rebound! Okada rolls out of the ring and Ospreay builds speed, but Ospreay handsprings when he sees Okada move. Okada slips in as Ospreay hits the superhero landing, to then dropkick him out of it! Ospreay ends up all the way in the corner while fans applaud. Ospreay is down so Okada takes his time to catch his breath. Okada walks over and goes to the outside. He brings Ospreay out to join him, to then scoop slam him on the ground! Okada walks around the corner while Ospreay drags himself up to his feet. But then Okada rockets in from around the other side, and boots Ospreay off his feet! 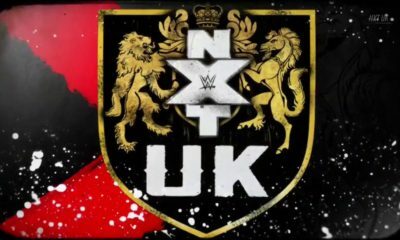 Referee Red Shoes comes out to check on Ospreay while ordering they bring this back in the ring. Okada slips into the ring to leave Ospreay to the mercy of the 20 count. Ospreay doesn’t stir until 10, and is slow to getting up. The count reaches 16, he beats it at 17. Okada goes over to Ospreay and stands on him. Ospreay keeps pushing him away while fans chant for “Ospreay! Ospreay!” He stands up and hits Okada back with body shots then forearms. Okada kicks low, DDT drives Ospreay down! Cover, TWO, but Okada keeps his cool. Okada has Red Shoes check on Ospreay and his neck. Ospreay is still okay to continue, so Okada brings him up for a neckbreaker. Cover, TWO, but Okada keeps on him with a straitjacket stretch. Fans cheer Ospreay on but Okada drives his knee into Ospreay’s back. Ospreay uses his legs to get the ropebreak, and Okada backs off. Okada stands over Ospreay, wanting him to get up. Ospreay gets up and headbutts Okada’s stomach, then throws forearms to back him down. Ospreay whips and ducks under Okada’s running chop, but Okada blocks the kick to spin Ospreay around into a boot. Okada whips but Ospreay handsprings, and enziguris! Both men are down but fans are fired up. Okada and Ospreay slowly stand up, Ospreay blocks, kicks and jawbreakers, then roundhouses Okada in the chest. Ospreay runs into the corner for a European Uppercut, then sits Okada down before running out and in for the hesitation dropkick! Okada rolls out of the corner while fans chant for Ospreay. Ospreay goes to the apron, springboards, and clotheslines Okada down. Ospreay realizes he has an opening, so he poses a moment, then grabs Okada in the dragon sleeper. He lifts Okada but Okada knees out. Okada whips but Ospreay holds ropes to deny Okada’s dropkick, then hit back with one of his own. Standing shooting star, TWO! Fans keep cheering while Ospreay stands up. Okada stirs, but Ospreay takes aim. Okada dodges the Robinson Special, then boots Ospreay out of a corner. Ospreay mule kicks back, then runs, but into the flapjack! Both men are down again, but fans are rallying. Ospreay gets to a corner, Okada comes over and puts him on the top, but Ospreay kicks him away. Ospreay climbs down and runs out, but Okada picks him up and puts him back on the top rope. Okada dropkicks Ospreay down! Ospreay tumbles to the floor while Okada rests in the ring. Okada exits the ring to fetch Ospreay, then whips him at railings. He runs in and boots Ospreay over the railings! Okada rallies the fans as he gets space. He runs back at Ospreay, but Ospreay uses the railings to launch for a flying forearm! Ospreay gets back in the ring, builds speed and FLIES! He takes out Okada with the Sasuke Special! Fans fire up while Ospreay gets Okada up and into the ring. Ospreay fires himself up and brings Okada up in the dragon sleeper. He lifts Okada up for the Bloody Sunday! Cover, TWO, and a close one. Ospreay grits his teeth while getting to a corner. Okada slowly stands, Ospreay takes aim, Robinson Special! He calls for it, springboards, but the OsCutter is blocked into a cobra clutch! Ospreay fades, but then gets a second wind to arm-drag Okada. Okada ends up in a corner, Ospreay runs in, but Okada pops him up into Alabama Slam position, to hit the reverse neckbreaker! But Okada is too tired to make a cover, so he instead gets up and gets back to a corner. Ospreay sits up, Okada knocks him back down with a running EuroUpper! Cover, TWO! Fans are thunderous but Okada keeps his cool. He brings Ospreay back up but Ospreay unleashes a strike fest! Ospreay then chops away Okada’s clothesline and hook kicks him in the head! Ospreay runs, but into Okada’s dropkick! Okada is in control while we go to break. NJPW on AXS returns as Okada gets to a corner. Okada climbs up and jumps for a big elbow drop! He then hits his Rainmaker pose, calling for his namesake move. Okada drags Ospreay up but Ospreay fights it off, so Okada rocks him with a right forearm. Ospreay staggers, Okada rocks him again. Okada gives Ospreay a third and Ospreay falls to the mat. Red Shoes checks on Ospreay, Ospreay is okay to continue, and fans continue to cheer for him. Okada takes his time catching his breath, and even toys with Ospreay. Ospreay fires up from the taunting kicks, but Okada keeps them up. Ospreay gets up and gives Okada a forearm, so Okada gives one back. They throw more forearms back and forth and even speed up until they’re hitting each other at the same time. Okada gets the edge, Ospreay staggers, but then Ospreay slips around to the full nelson. Ospreay goes to heel kick but Okada ducks and retaliates with a EuroUpper. Okada runs but into Ospreay’s flip kick and enziguri! Okada staggers but boots Ospreay again. He runs again, but into Ospreay’s Spanish Fly! Cover, TWO! But Ospreay grabs the arm, and drags Okada up. With wild eyes glaring a hole in Okada, Ospreay clubs him with a clothesline, a bit like a Rainmaker! Cover, TWO!! Ospreay can’t believe it, but he keeps focus as he climbs up top. He stands up and focuses, for the inverted 450! It hits, Ospreay covers, TWO! And again, Ospreay can’t believe it. Fans chant for Ospreay as he grits his teeth and glares at Okada again. Ospreay rallies the fans, prepares his elbow, Off with His Head! He drags Okada up, runs and springboards, but Okada again denies the OsCutter to lift Ospreay up into a Tombstone piledriver! But Okada won’t end it there. He drags Ospreay up, swings him out, Rainmake– No, Ospreay flips through into a sit-out powerbomb! Cover, TWO!? Ospreay is red hot with frustration, but he gets to a corner to take aim again. Okada slowly stirs, Ospreay unloads kicks and springboards for the OsCutter, but Okada dropkicks it out of the sky! Okada pulls Ospreay up, German Suplex and bridge! TWO! Both men are down from exhaustion, but fans are still rallying for Ospreay. Okada stands first, and brings Ospreay up again. He clotheslines Ospreay once, then brings him up again, for another. Okada isn’t done there, he brings Ospreay up, swings him out, but Ospreay dodges to handspring again! Only to get caught for the spinning Tombstone! Okada brings Ospreay up, for THE Rainmaker! Two of the best in NJPW, but it is still the IWGP Heavyweight Champion who stands tall. Fans still chant for Ospreay, and though it takes everything he has right now, Ospreay stands up. Okada offers Ospreay a handshake, but Ospreay goes in for the hug. There is much adoration and respect between Chaos’ top champions as Ospreay also bows to his leader. Ospreay heads to the back while Red Shoes hands Okada his championship belt. With the great showing the Aerial Assassin gave against the Rainmaker, will he one day face him again for the title? Meanwhile, Okada speaks. “I wanna say three things.” First, Ospreay really is amazing. He loves Ospreay as a wrestler, and also like a little brother. Second, he thanks the fans for supporting NJPW for 46 years. “Year 47 starts tomorrow.” He brings up Tanahashi, but no. Naito? No, not him either. Kenny Omega? No, done that already. But you can count on Okada! Third, there isn’t a third. Gedo isn’t in the ring right now, but today, on this 46th Anniversary, Okada wishes to end their partnership. Huh!? 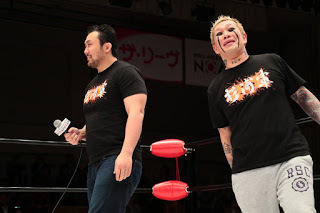 “Of course I’m joking, dumbass!” Gedo is relieved as Okada vows they’ll be together for the 47th, 48th, 49th, 50th, and so on! Gedo & Okada will still make it rain! For the 47th, 48th, 49th, 50th and forever!! While he vows to make it rain forever, will Okada be the IWGP Heavyweight Champion forever? Ospreay assures everyone this match wasn’t about him showing disrespect to Okada. He just wanted to prove a point that a Junior Heavyweight can still hang with the Heavyweights. He knows he came so close, but that in itself an accomplishment. Ospreay thanks Okada for the lesson. As for Okada, he still feels Ospreay is an incredible wrestler. It’s why he’s the IWGP Jr. Champion. Appearing in the Anniversary Show is a rare privilege, and “competing against each other on such a big stage” will be a great memory for them both. It will definitely be a match fans remember for quite some time. How long will it be before we see Okada VS Ospreay II? A great bit of NJPW action right here. Taichi VS Naito was a solid opener, and showed that while Taichi had people ringside to cheat for him, Naito was confident enough to do it alone. 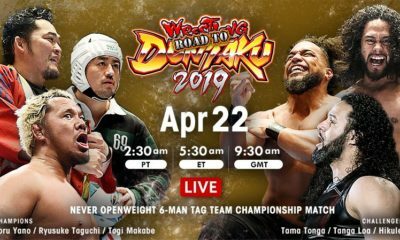 Naito wins because he’s been on a great roll as of late, and Taichi still has plenty of Heavyweight Division matches to make a good record for himself. 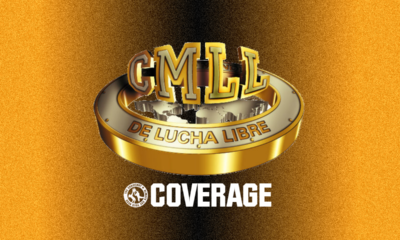 At the same time, this feud can continue given how Suzuki-Gun and Los Ingobernables de Japon are in a bit of a faction war over various titles. I was surprised there were no post-match interviews for them, but perhaps Naito’s spit spoke for itself. The main event was a spectacular showing of two great champions, and Ospreay definitely shows that a Junior can hang with a Heavyweight. Okada wins because he’s Okada, and will roll right into the next title defense to challenge Tanahashi’s historic streak.